Many factors drive banks toward acquisitions, including increasing efficiency due to size, loan/deposit growth opportunities, or expansion of geographical footprints. However, one consideration is always dominant — improving return on investment, or ROI. Whether short, intermediate, or long-term, ROI is the most critical factor in the M&A decision. 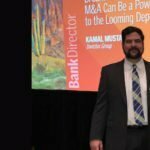 Even community banks that haven’t contemplated a merger or acquisition in the past are now having frank M&A discussions in the boardroom. In an economic environment with low interest rates and low yields, an M&A deal may be a better strategic option than organic growth for many overcapitalized banks. Prior to the recession, bank M&A had settled into a well-established, time-proven approach. Bank management established targets and criteria, while investment bankers, lawyers, and accountants facilitated the M&A structure and process, weighing tax and accounting considerations. Accretive to earnings gained acceptance as one of the primary justifications for a transaction. Unfortunately, this hasn’t changed. Bank executives still trumpet accretive to earnings, focusing solely on the gross earnings of acquisitions, while ignoring the substantial impact of regulatory changes that directly affect their individual and consolidated ROI. These transactions have misled and damaged the present banking environment. 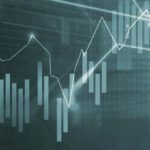 Apart from the potential problems created for buyers, flawed acquisition multiples have distorted the perception of market pricing for a large number of banks that should be aggressively seeking acquirers, as they continue to lose value in a highly competitive, capital- intensive and low interest-rate-spread market. 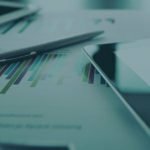 This report takes a fresh look at the U.S. banking universe by using forward-looking analytics to examine the implications of changes in regulatory methodology that have substantially altered the underpinnings of the traditional M&A process. It also includes an updated Invictus Acquisition Gauge – an assessment of the best strategic option for every bank. 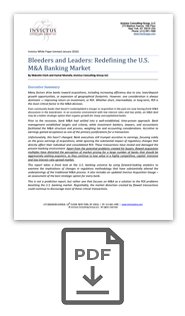 This is not a predictive report, but rather one that focuses on M&A as a solution to the ROI problems besetting the U.S .banking market. Regrettably, the market distortion created by flawed transactions could continue to discourage most of these critical transactions. 264 banks must sell. These banks have very limited strategic options due to low capital levels and poor earnings power. 493 banks should consider selling. These banks have somewhat more flexibility than Must Sell banks because of their higher capital base, but lack earnings muscle in their asset portfolios. 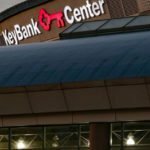 936 banks must buy. These banks have sufficient capital, but less-than-robust earnings power within their existing asset portfolios. 1,291 banks should buy. These banks will do better if they make selective acquisitions. 3,120 banks are in the “balanced” category and are well positioned for the future. This amounts to about 50 percent of the community banks in the U.S.
16 banks are outliers. These banks have very strong earnings, but very weak capital levels. Since these banks are well outside the market norms, their strategic options cannot be assessed with this analysis. However, the outliers make great acquisition targets. U.S. regulators established new approaches and methodologies for capital management after it became clear that Basel I and Basel II failed to prepare banks for the recession of 2008. Regulators mandated capital stress testing for the large banks. The Comprehensive Capital Analysis and Review (CCAR) exercises for the largest banks laid out the fundamental changes in the post-recession regulatory capital adequacy calculations, and the Dodd-Frank stress tests further reinforced this regulatory shift. In essence, regulators imposed stress tests for 80 percent of U.S. lending assets, which are held by about 100 banks. 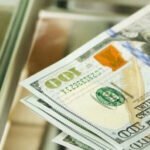 Approximately 6,000 community banks hold 20 percent of the remaining lending assets. Regulatory capital increases resulting from stress tests trickled down to the community banking market when regulators began imposing relatively conservative premiums over the prescribed PCA leverage ratios. The very concept of a stress test, where a bank is subjected to a two-year recessive scenario, magnifies the impact of asset risk on a bank’s required regulatory capital level. Loan vintage, composition and distribution have become critical components in evaluating and calculating a bank’s regulatory capital level. Acquisitions that ignore the regulatory capital requirements of their targets and instead focus on earnings and market or book value can be considerably flawed. This analytical error is further amplified by the fact that many target banks with higher earnings have a greater than average dependence on higher risk, regulatory capital-intensive assets. Regulatory capital calculations focus on the different levels of risk associated with different loan categories. While this emphasis was present pre-recession, the new approach requires evaluating this risk under extreme conditions best described as a “hypothetical severe recession scenario.” In other words, the impact of individual risk characteristics associated with different loan categories and subcategories is magnified, which raises the importance of specific asset risk on the calculation of capital adequacy. In mathematical terms, this is like changing the X variable in an equation to X squared. Regulatory capital is affected by each bank’s unique loan portfolio distribution and the specific capital requirements associated with different loan categories/subcategories. Two banks with identical total assets could have substantially different regulatory capital requirements based on their loan mix. Even if their return on total assets were identical, their “return on required regulatory capital” would be radically different. Given this, it becomes clear that Return on Assets is no longer a valid measure in acquisition analysis. The proper measure of value in an acquisition is now found by taking the Gross Asset Return divided by the Regulatory Capital Required to Support the Assets, (which we call the Invictus Return on Required Capital Ratio). Obviously, the impact of cost of funds and operating efficiency and the all-important franchise value must be applied once this return is calculated. First, they had a portfolio mix of high return and high-risk assets that required more capital relative to other loans. Second, they tended to have higher proportion of loans with pre-recession vintages. These loans tended to have higher margins and far greater risks associated with them. These factors highlight the absolute necessity for acquisitive banks to stress test their target banks. They must review in detail the target bank’s regulatory capital requirements, as well as the impact on the capital requirements of the consolidated entity. To properly estimate a bank’s Regulatory Capital Required to Support Its Assets, Invictus follows a CCAR-like economic scenario and uses publicly available Call Report data and Invictus proprietary analytics to stress test all but the largest U.S. banks. This process provides a reasonable estimate and a fairly accurate relative calculation of each bank’s regulatory capital requirement, based on its unique portfolio distribution. Because we stress test almost every U.S. bank, we can look at relative capital requirements in the country, in a region, or in a categorization of banks. We separate banks into five categories, with increasingly more attractive strategic options: Must Sell and Should Sell (the “Bleeders”), Must Buy, Should Buy and Balanced (the “Leaders”). This categorization is the Invictus Acquisition Gauge. It is important to recognize that this analysis focuses on the best strategy for an individual bank, and doesn’t predict likely activity. Must Sell banks have very limited strategic options due to low capital and poor earnings power. We categorized 264 banks as Must Sell (or merge). Invictus believes these banks may experience very little M&A activity in the near future, although they are the ones that need it the most. These 264 banks have been caught in the perfect storm of the post-recession, with tightening of regulatory capital requirements, declining loan demand and shrinking net interest margins. They have depleted capital levels and low to negative return on the capital required to support their assets. These banks will continue to hemorrhage, further depleting their capital levels. Their competitive position will weaken. 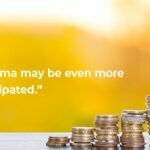 Most are highly susceptible to interest rate shock. Many of these banks have been lulled into a false sense of security and value due to the high multiples that have been paid for acquisitions in the last few years. The smarter banks in this group will actively seek a suitor to capitalize on current high multiples. These banks are not attractive targets for acquisition in the longer term unless management and owners are prepared to accept discounts to book value. A rising rate environment will not be friendly to most of these banks due to the fixed/floating rate distribution on their portfolios, coupled with their existing liability and capital structure. Management failing to “bite the bullet” and acknowledge the need to sell is the most likely detriment to M&A activity in this group. Should Sell banks have somewhat more flexibility than Must Sell banks because of their higher capital base, but they do need to take action. Our analysis identified 493 Should Sell banks. Invictus believes these banks will also experience very little M&A activity in the near future despite the fact that shareholder value could be maximized by selling in the present pricing environment. These 493 banks have better capitalization levels than the “Must Sell” banks, but extremely low to insignificant returns on the capital required to support their assets. Many have high fixed-cost structures that further weaken their capital and return levels. Their higher capital provides a cushion to absorb their hemorrhaging. This capital might allow some flexibility in changing the direction of their future earnings. Regulatory pressure, while deferred, will inevitably grow as capital levels are depleted. Their higher leverage ratios and the resulting lack of regulatory pressure coupled with the acquisition multiples being paid in the last few years have created a false sense of security. The risks of interest rate stress and interest rate shock in a rising rate environment will increase. False complacency regarding capitalization and ignoring low Invictus Return on Required Capital Ratios will curtail M&A activity in this group. Must Buy banks have sufficient capital, but less-than-robust earnings power. These 936 banks have decent to good levels of capital, but low to mediocre returns on the regulatory capital required to support their assets. Organic growth under present and expected market conditions will not be an adequate solution to these banks. They should experience some M&A activity in the near future. These banks are fortunate to have excess capital (above minimum regulatory requirements) that can be used to improve their returns. Most will have difficulty generating enough organic growth to solve their low returns on the regulatory capital required to support their assets. Most of these banks would be better served by using their excess capital levels to acquire or merge with banks that have higher returns that can, upon consolidation, increase their combined return on the regulatory capital required to support their assets. Present-day multiples could be a deterrent to this option. While regulatory pressure might be minimal, it should not create complacency regarding return on shareholder investment. Mergers with smaller institutions that are undercapitalized, but that have high Invictus Capital Return Ratios, would be ideal transactions in the present and near future. Should Buy banks have higher levels of capital than the Must Buy banks and should redeploy this capital to acquire higher yielding assets or operations. These 1,291 banks are in a good position to take advantage of M&A opportunities. These banks are generally well capitalized with sufficient capital cushions that would allow them to undertake actions to improve their overall returns on capital. The lesser capitalized members of this group have strong Invictus Return on Required Capital Ratios that could, over time, protect and enhance their leverage and shareholder value. Most of these banks can improve their positions, to some extent, through organic growth. However, their capital position could more effectively be used to achieve greater success through judicious acquisitions. 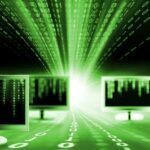 Balanced banks are well positioned for the future. We found 3,120 Balanced banks, just over 60% of all community banks in the U.S. They have a good combination of a strong leverage ratio and Invictus Return on Required Capital Ratio, and should see better than average M&A activity. A small percentage of this group might have low Invictus Return on Required Capital Ratios that are offset by strong operating efficiencies created by their geographical footprint/portfolio mix/management practices. They are likely to be acquirers for smaller banks rated below them and excellent targets for larger banks ranked above them. Their results are indicative of strong management and, in a few cases, niche geographical territories. Irrespective of need, most M&A activity is likely to come from this group, driven by their strong management. These banks are strong performers and have plenty or even too much capital, but they have many options. M&A may not be an attractive option to them – a bank they acquire may have a lower capital efficiency, which may reduce the combined bank’s overall capital efficiency. A better option could be return of capital to shareholders through buy backs and dividends, or large asset purchases. Part IV: What Does It Mean? Figure 2 measures the true return of banks assets against the capital required to support these assets. 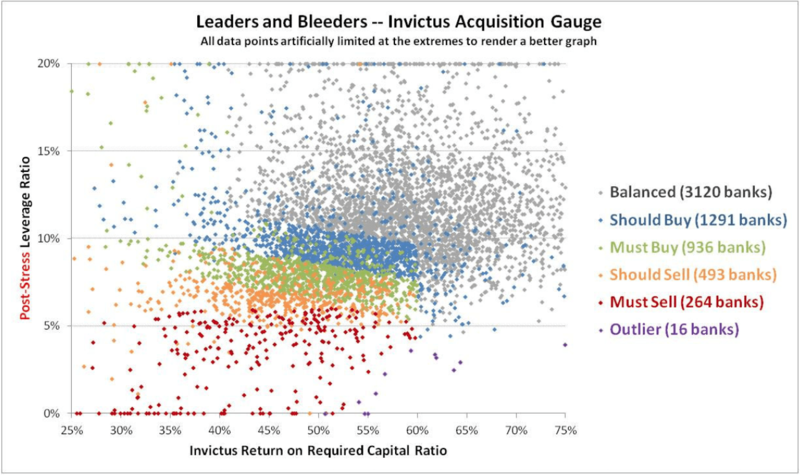 After stress testing each bank, calculating an individual post-stress leverage target consistent with prevalent PCA adequately capitalized guidelines, we assign each bank an initial Invictus Acquisition Gauge value and then plot the position of the bank with its capital level against the calculated Invictus Return on Required Capital Ratio. After initial classification, each bank is rated based upon three additional measures. 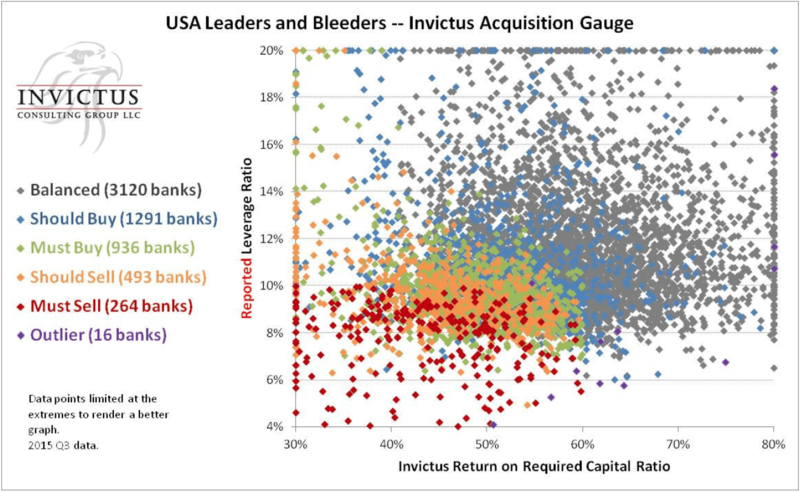 Third, banks with unusually high Invictus Return on Required Capital Ratios, but low post-stress capital. These banks are in a position to grow their way into a stronger capital position. The first and second level of review can result in a one notch upgrade or downgrade in the bank’s classification, and the third can result in an upgrade. This is a comparative ranking, meaning that upgrades and downgrades depend upon the banks’ relative ranking among the entire universe of community banks. We display these graphs on a Reported Capital and Post-Stress Capital basis. The effect of the additional measures are why some banks appear to be outside their natural band, even though they have better or worse values for Invictus Return on Required Capital Ratio or Post-Stress Capital Ratio than their neighbors. Our bank clients use this gauge to identify targets that are truly accretive to earnings, as well as to evaluate and create strategic plans that would allow the bank to improve its competitive position. (See section below on How Banks Use This Data). Barring the raising of new capital, the objective of bank management should be to improve the bank’s horizontal position (earnings capacity), which would over time organically improve its vertical position (capital adequacy). The ultimate goal is to improve the bank’s ROI. In creating the appropriate subgroups, we consider not only the static capital available for acquisitions, but also each bank’s ability to generate profits that would contribute toward increasing or maintaining this excess capital. 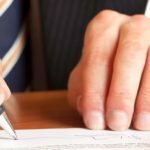 This process is the only practical way to identify and justify “truly accretive acquisitions” that do not end up diluting the acquirers’ overall return on required post-acquisition regulatory capital. This explains the left to right slope of the Invictus Acquisition Gauge bands on the chart. Banks with lower earnings power, as represented by the Invictus Return on Required Capital Ratio, must hold more capital, as represented by Invictus’ post-stress capital levels calculations. Invictus clients use this analysis as an early-stage assessment of potential targets or merger partners, before screening for other considerations. The data can be filtered by geography, asset size and other criteria, producing a workable short list of potential targets that will be truly accretive to earnings The approach is to look for banks with a higher Invictus Return on Required Capital Ratio, but lower post-stress leverage ratio – in other words, banks that are more capital-constrained yet operate with greater capital efficiency than our client. (The same analysis in reverse can be used to evaluate discounts-to-book for banks with lower Invictus Return on Required Capital Ratios). 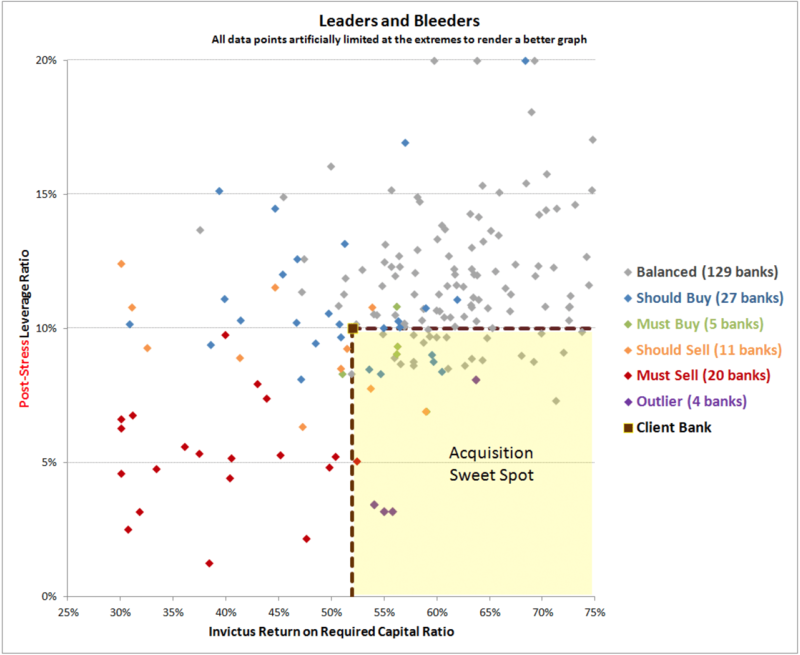 Banks in the lower right corner of the graph inhabit the “sweet spot” for acquisitions. (Banks to the left of that corner would have to be purchased at discounts-to-book to achieve similar benefits). 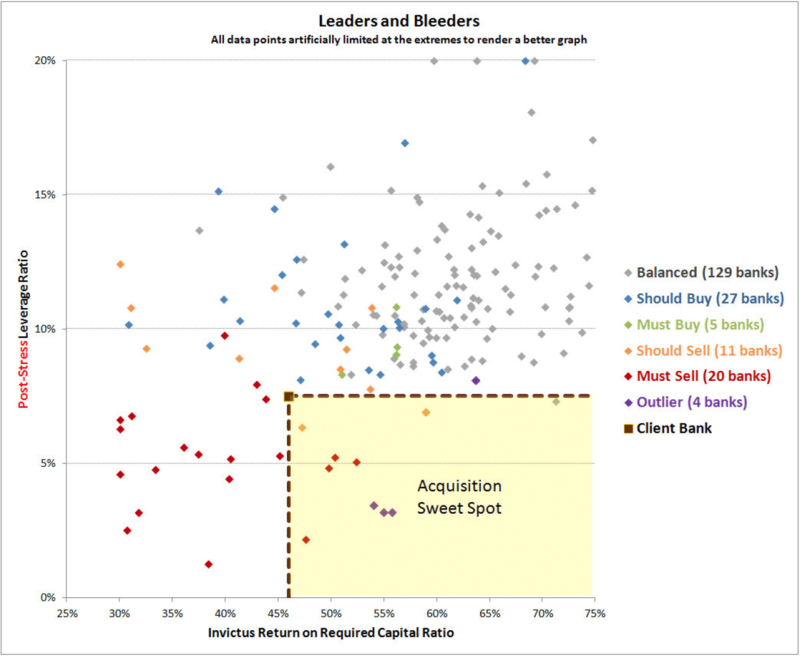 For instance, our client, a Should Buy bank, should prioritize any bank in the Sweet Spot box above. Note: The Invictus M&A analysis is not a predictor of what will happen – we do not expect every bank to undertake M&A activity in line with the Invictus Acquisition Gauge. Rather, it is an assessment for any individual bank of its relative position within the market, and its best strategic option. One of the primary objectives of bank management is to increase the bank’s ROI or shareholder value. The most important driver is the overall efficiency of the bank’s assets, taking into consideration the capital required to support these assets. Limited loan demand, increased competition and declining net interest margins have limited the ability of many banks to achieve these improvements through traditional organic growth. For these banks, meaningful changes can be achieved only through acquisitions. Or in many cases, shareholder value can be protected only through divestitures. 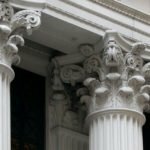 While they are many important qualitative and quantitative considerations that drive transactions, any analysis that ignores the regulatory capital requirements of acquisition targets and their net impact on the acquirer’s regulatory capital requirements is seriously flawed and a disservice to the bank’s shareholders. 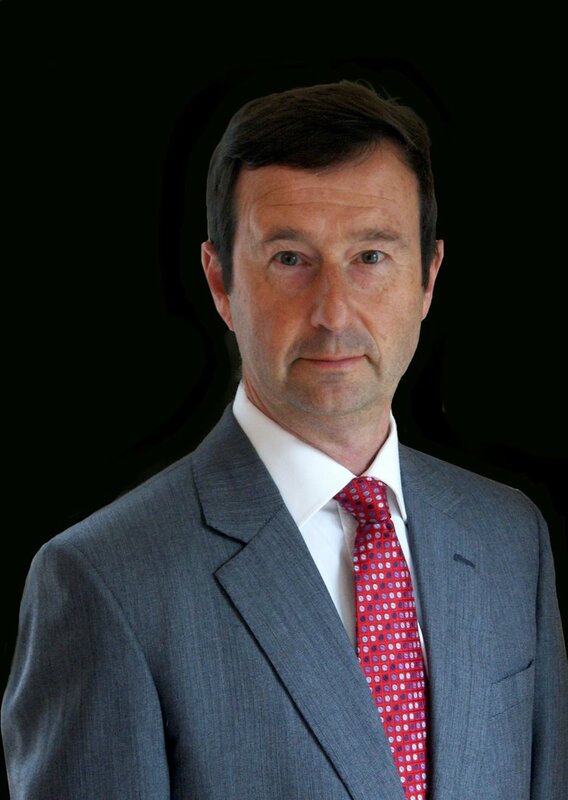 Malcolm Clark, Invictus’ managing partner for technology and information, has spent his entire career in international financial markets and trading technology. His varied career has involved repo trading, fixed income strategy, trading technology and treasury management at Morgan Stanley, and Credit Suisse in New York, London, Tokyo and Sydney. Prior to joining Invictus he was a Director at Anvil Software, a global repo technology specialist firm. He has a BSc in Economics from the Massachusetts Institute of Technology and London School of Economics, and is based in London. 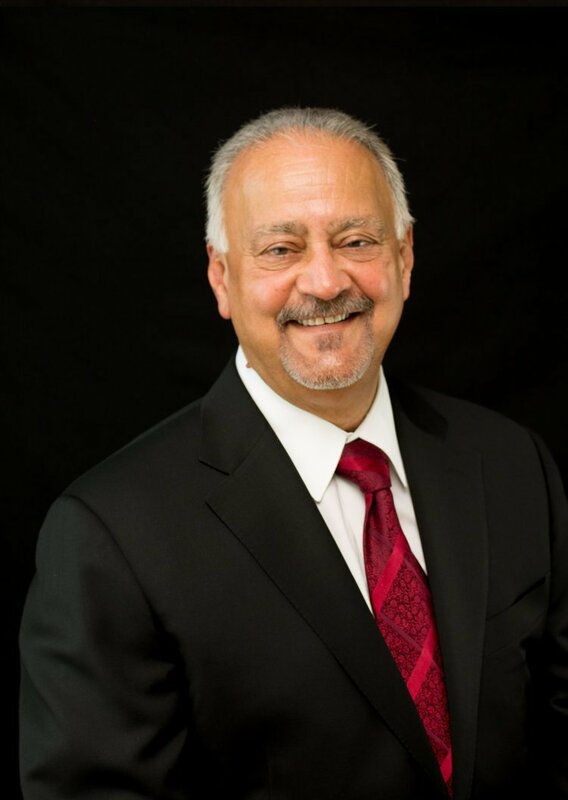 Kamal Mustafa is the chairman and CEO of Invictus, which he founded in 2008. He has a banking/investment banking career spanning more than 40 years. He was the head of Global Mergers and Acquisitions at Citibank in the 1980s. He was managing director of Merchant Banking and M&A for PaineWebber’s hostile takeovers and defences. He ran a $1-billion leveraged buyout fund. Earlier in his career, he was head of Corporate Finance at Connecticut Bank and Trust, a $3-billion community bank. 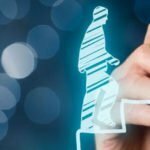 Now he’s working with an Invictus team bringing global analytical techniques to the community banking market. The Invictus Consulting Group is the industry thought leader in bank analytics. The data-driven company’s groundbreaking tools and forward-looking analytical approaches have changed how bank executives approach strategic and capital planning, stress testing and mergers and acquisitions. Our analyses give bank, insurers and investors the competitive edge in executing their plans and developing their businesses.